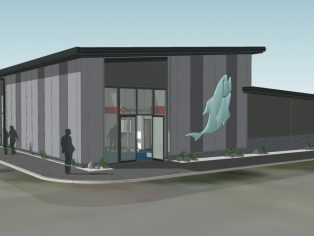 Contractor to deliver new fish market as part of £4.2 million revamp. The project, designed by GDLodge architects, includes the construction of a new 37,670 sq ft portal-framed building, comprising 10 joined but separate units for tenants, as well as loading areas, specialist chiller and freezer rooms, and ancillary office space. The work is being carried out while the market remains open to the public and traders continue to operate in the existing fish market building. Once the new facility has been completed, Russells will also demolish the old building and use the space to create new car parking and circulation areas. Computer generated image of the completed project.